This Social Enterprise Founded by Sue Goode MBACP (Accred) whose aim is to promote a sense of community spirit, wellbeing and positive healing through the process of group rhythm. As a senior practitioner Counsellor, Psychotherapist and Supervisor my research and experience inform me that it really does promote and help well-being and increase self esteem. In its simplest form, It’s emulating the first loud rhythm ever heard- the mothers heartbeat whilst in the womb! Slapping a beating a drum certainly helps to de-stress and help us to self express our natural innate rhythm. My participants feedback social, cognitive, emotional and health benefits they experience, especially if they attend regularly. These include Reduced blood pressure, deeper sense of belonging and increased confidence and better mood and ability to focus and concentrate. 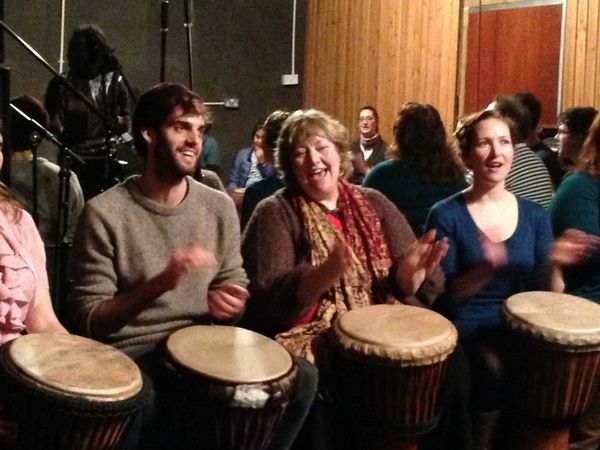 I see djembe drumming as helping to build and link neural pathways in the brain. By drumming with both hands it helps stimulate both left and right brain hemispheres and its like a total brain workout! I also wanted to provide a valuable teaching platform for talented and gifted traditional African musicians to showcase and perfect their teaching and English skills whilst staying true to their Cultural Heritage and to help them bring this rich tradition to a UK audience and participants. Really showing us how to express, make music and most importantly how music can makes us feel good! Here is a link to join us, book on and pay.